[German brief here] Only a few weeks ago, a motorsport rally fan got back to me saying “I like your smart stopwatch, but I need something a little different”. The resulting new rally timing app just went live toady. The person, as it turns out, was a huge fan and industry insider of rally series such as the World Rally Championship (on Facebook) and the many smaller, local events. There is a great community behind the car rallye sport (for some, it’s a rally, for others a rallye) in particular in Northern and Central Europe, but also all the way to Africa and Australia. So, as a spectator, you chose a certain spot, where you expect to have a good (long!) look at passing cars, and some real action: Sharp turns, jumps and the likes. (As has to be expected, people like accident-prone sections in particular. Accidents = action.) However, standing there somewhere in the wild with cars passing you one by one, most likely in start order, as a spectator, you wonder: Who’s winning? At this point at least? After an hour or two, the official result is in and everybody knows the answer. However, standing right there at that needle turn, where’s the fun in waiting an hour to figure out that rally car #13, which is just passing you, actually WAS three seconds ahead of the competition at this point! That’s where Herotime comes in. People have used traditional handheld stopwatches to time the time in between passing cars to get a feel for performances. They also use simple egg timers to estimate the next cars arrival. Because, it’s also a matter of security to guess when the next car will arrive and thus, crossing the track becomes a dangerous option. But these timing means are cumbersome, complicated or deliver little insights. And they are boorrrring. What you really need is a new kind of interval timer stopwatch. So, after a number of discussions back and force with the insider that contacted me, I made a special stopwatch just for rally fans, and fans tell me it’s awesome and an absolute industry first: Meet the HEROTIME Rally Timing app or, as I call it for now “RallyTime Pro – Rally Car Timing” (the link goes to the app store). RallyTime Pro app, also featuring physical button support, night color scheme and open timing of any rally beyond the set of predefined ones. Learn more and give me feedback, too! 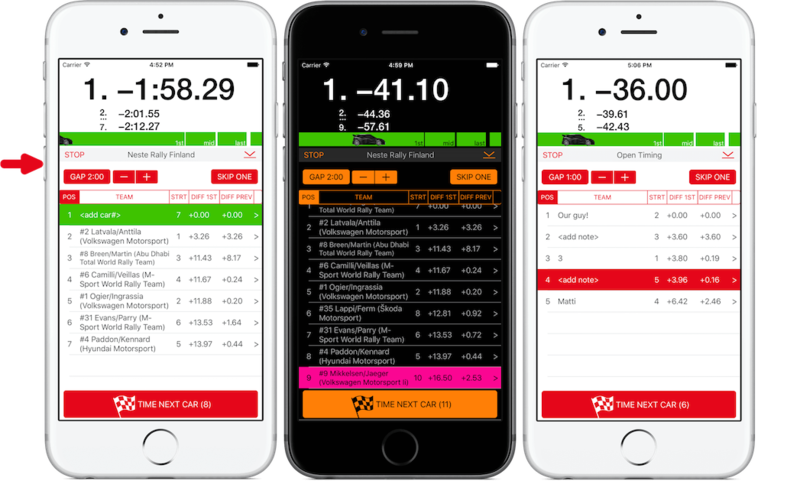 If you are interested or just curious, you can also learn more about the best motorsport rally timing app on the new website (also in Germany, if you prefer) and even a small, dedicated Facebook page. See, I am always asking for feedback and suggestions, including any other timing problems you face, and I am listening and acting. So, what’s on your mind when you use the HEROTIME smart stopwatch? Maybe there is a special solution to your special timing problem, too! Gerade im App Store live gegangen: Eine neue Stoppuhr App für Events mit Interval-Start, das heisst, Teilnehmer starten einer nach dem anderen in gleichen Abständen. Die erste Version ist speziell für Zuschauer von Auto-Rallyes gedacht. Zuschauer stehen hier irgendwo an der Strecke und wundern sich, welches der nacheinander vorbeiflitzenden Autos, denn nun bis zu diesem Punkt am schnellsten war. Die App ist aus der Rückmeldung eines internationalen Rallye-Fans und -Experten entstanden, der das Fehlen einer spezifischen Stoppuhr für diesen aufregenden Sport bemängelt hat. Mehr dazu im ausführlicheren, englischsprachigen Artikel zur neuen RallyTime Pro Stoppuhr oben.